Quick and nutrient rich breakfast smoothie. Peanut Protein Smoothie with blueberry, oats, almond milk, greek yogurt, banana and peanut protein powder. 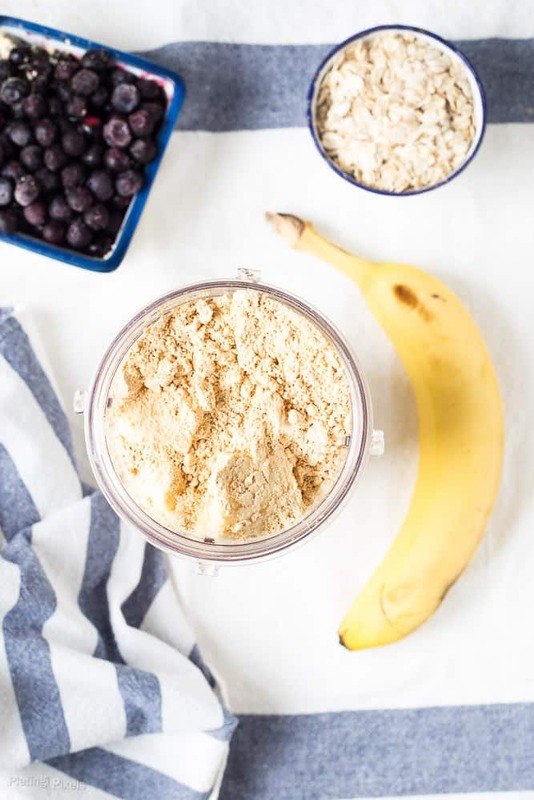 Within this recipe post you’ll make a creamy protein breakfast smoothie that’s full of peanut protein. Plus you’ll learn how to get the perfect smoothie thickness, without using any ice. It’s a new year and I’m so excited for 2016! With the new year comes the usual resolutions, often involving losing weight and/or eating better. It may be cliche but that’s one of mine. Thankfully I didn’t wait till January 1st to start going to the gym; working out has been part of my routine for a long time. Ever notice how the gym is crazy packed early in the year? I got one of the last few available bikes in my cycling class this morning due to the many new faces. Another part of my routine has been breakfast smoothies. Often fruit (and even some veggies) plus a protein powder is my go to breakfast. It keeps me nourished and full all morning, plus it’s easy to prep. Less empty calories for breakfast means it’s easier to enjoy food the rest of the day. 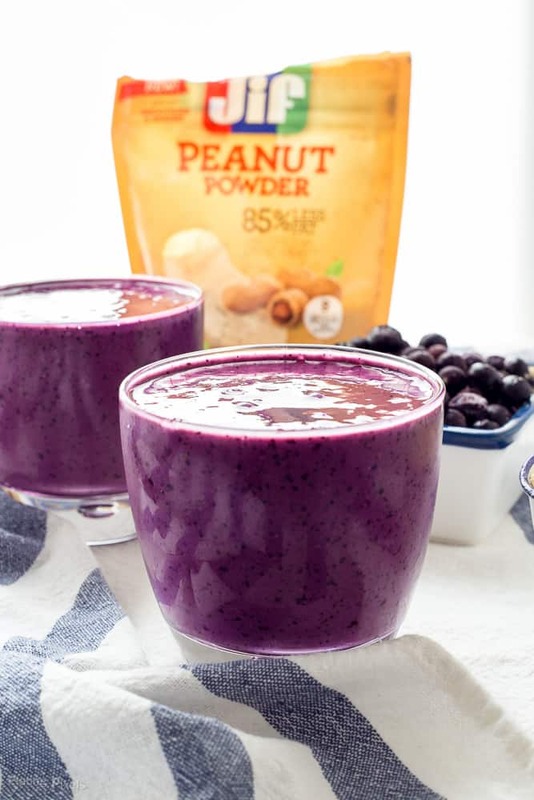 This Blueberry Peanut Protein Smoothie might be a new favorite of mine. 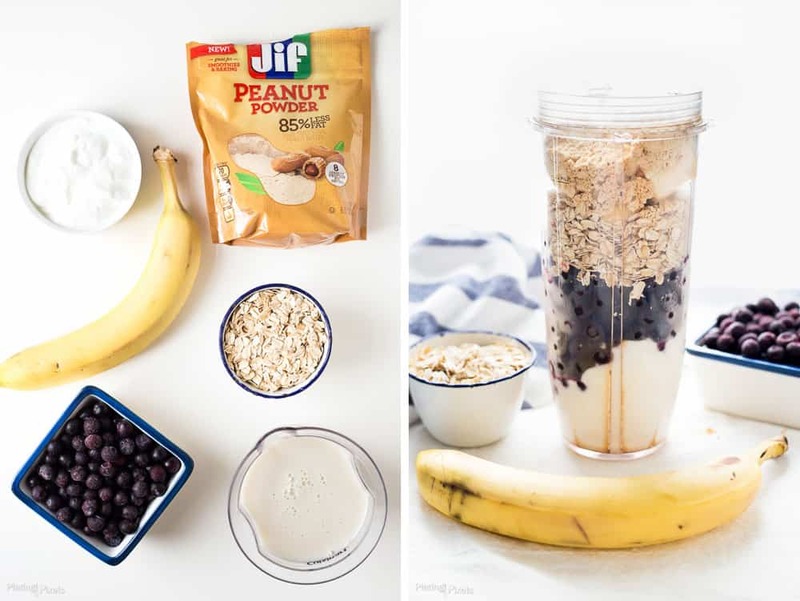 A simple mixture of almond milk, greek yogurt, oats, banana, blueberry and Jif™ Peanut Powder. I dare say it’s like drinking a peanut butter and jelly for breakfast! I’ve used other protein powders in my smoothies, but was excited to try this peanut protein powder. It has the same amount of nourishing protein as peanut butter, but with 85% less fat; that means all the peanut butter taste with less calories. It’s made from just one ingredient, fresh roasted peanuts, and without added sugar – a good way to fuel your day and stay on track with New Year’s resolutions. This protein smoothie is also beautiful and a natural in front of the camera. I wish all my recipes were this photogenic. 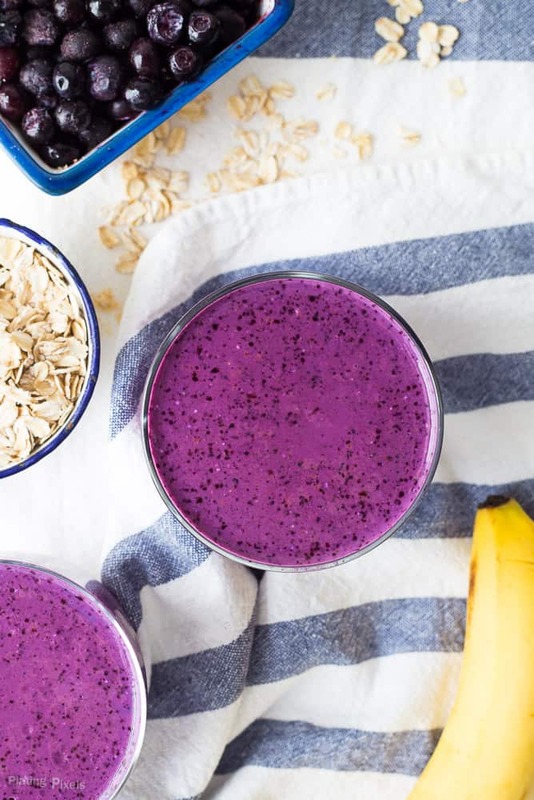 A vibrant (almost fluorescent) purple from colorful blueberries creates an appealing peanut breakfast smoothie. I’ve heard the more colorful your food is, the more fulfilling it is. This is just from a visual perspective, however colorful foods are commonly more nutrient rich anyways. 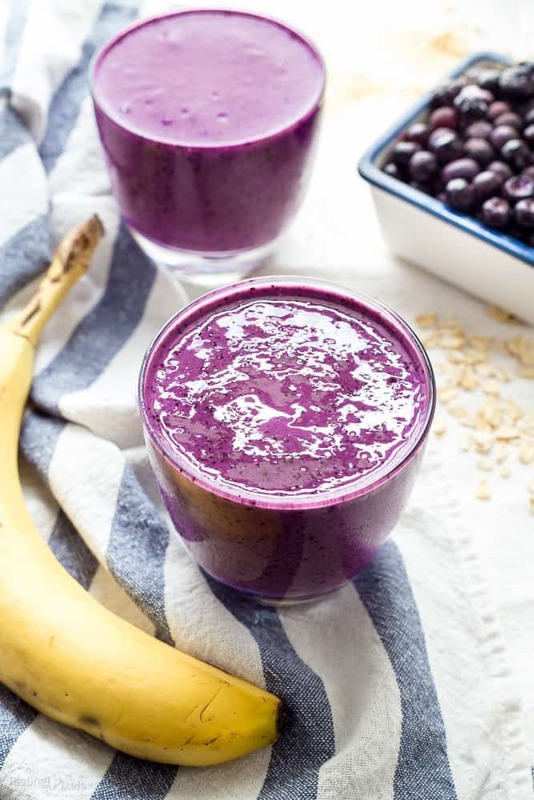 Enjoy this Blueberry Peanut Protein Smoothie as perfect start to your day and the new year. One serving has 25 grams of protein, 88 grams of (complex) carbs, 15 grams of fiber, and only 6 grams of fat; all with less than 500 calories of naturally sweetened goodness. This protein smoothie recipe has a ratio of ingredients to create a perfect thick smoothie. I find equal parts frozen fruit to liquid, plus an equal amount on non-frozen fruit or yogurt is the ideal ratio. Be sure to freeze fruit once it reaches ideal ripeness, or buy frozen fruit. This way you’ll always have ingredients on hand for your breakfast smoothies. Flavor profiles: Peanut butter and sweet blueberries, almost a hint of peanut butter and jelly in your smoothie! Texture: Thick, cool and creamy, with just a bit of texture. 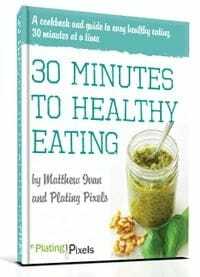 Dietary Options/Substitutions: This recipe is gluten free. Omit yogurt for vegan, may need to add more almond milk. Nutrient rich gluten free breakfast protein smoothie. Add all ingredients to a blender and blend until processed, thick and creamy; about a minute. Note: Depending on desired thickness, add more frozen blueberries or almond milk to thick or thin it out. 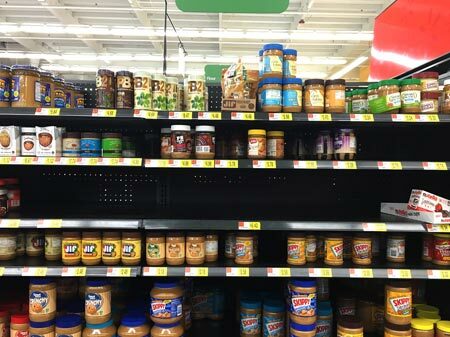 Find Jif™ Peanut Powder in the peanut butter aisle of your local Walmart. I am terrible at getting up earlier than I need to to get to work 🙁 is it possible to make these before and freeze them? I wonder what the texture would be like once thawed. Hi Vicky. I know dairy tends to crystallize and separate when frozen. You could try but maybe omit yogurt and add extra almond milk. I am going to make it…. Glad to hear that Monique. Thanks! This looks AMAZING!! I feel healthier just reading this recipe. I will definitely be making on of these after I go to the grocery store. Thanks for sharing! Haha I wish it were that easy Amber, but that’s a great compliment. Thanks and enjoy! I love a good smoothie! I’ve never used that peanut butter powder before, but it looks great! This looks so yummy! 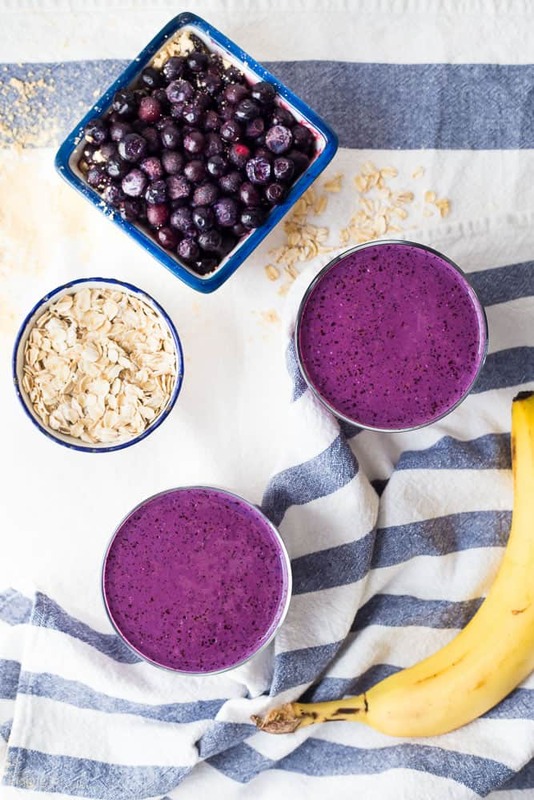 I’m always on the hunt for good smoothie recipes so I’ll definitely be pinning! Yum! This looks so good, I actually have some peanut butter powder and I wasn’t sure what to do with it! Such a beautiful color! This is something the whole family would love. I love that vibrant purple! I’ve never tried peanut powder and I don’t even remember seeing at the supermarket, but if I find it, I’ll give it a try. I am always in the market for a new smoothie recipe! This sounds delish! I always enjoy finding new smoothies too. Thanks Sarah! I have a few go to smoothies that I stick with but like changing it up too. Thanks so much Chrisy! Congrats and good luck with the New Years resolution! Sounds like a great combo of flavors in this smoothie! I love that peanut butter powder, too! It’s so yummy for how nutritious it is. Thanks Leah! This smoothie sounds so good! I haven’t used peanut powder but I’m anxious to try it. It’s a great way to add peanut butter flavor without all the calories. Thanks! Just in time when I was looking for healthy smoothies. I love the color and the healthy ingredients. It must taste so good. Thanks for sharing! It sure does and glad you found it. Thanks Kam! I make a very similar version of this, but I’ve never tried it with the blueberries! Hi Joanna! Blueberries are one of my favorites in smoothies! Lots of fiber too. It’s new to me but I like it now! Thanks so much Sabrina, that’s so sweet of you to say! This looks so good! I’m always looking for new protein-packed breakfasts. Thanks! It sure is! Thanks and you’re welcome Chloe! Oh this is making my mouth water. I have been wanting to get into smoothies recently. And this one is such a gorgeous color… how could I not want to drink it?! My thought exactly Jaelan! Hope you enjoy and good luck with the smoothies. They can be pretty tasty and fun, but still nutritious. Thanks!